St. Petersburg locals and visitors have had the opportunity to acquire a personal guard from the ranks of a historic feline regiment that has been protecting one of the world’s greatest museums for centuries. The Russian State Hermitage museum on Saturday gave away 11 of its famous cat guards to willing visitors, as the number of furry staff grows beyond the museum’s ability to support them. Cats have been guarding the Hermitage’s vast collections from rodents since the museum’s founding in 1764. But they are not mere house pets hunting mice at their leisure. Protecting the art is their official task, as decreed by an 18th century ruling by Catherine the Great. Cats have stood guard the Hermitage ever since, excluding a brief period during the Siege of Leningrad in WWII, when they died out due to a lack of food. However, the cat guard was later revived. Over the years, the furry sentinels have become an exhibit themselves. 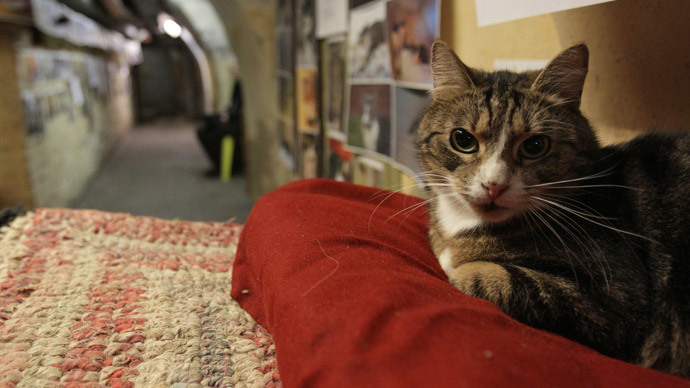 A special tour called “Where the cats live” takes visitors around the museum's basement – the felines’ home turf. If you've always dreamed of having an official, Russian Empress-approved ‘cat guard’ member by your side, but missed the latest giveaway, don't despair – the cat population in the Hermitage has been on the rise lately, and the museum organizes regular events to find new homes for its pets. It has no allowance for the cats in its budget, but receives a steady flow of donations in the form of both money and cat food, specifically for the felines. The Hermitage now houses over 70 cats, and holds Hermitage Cat Day every year.